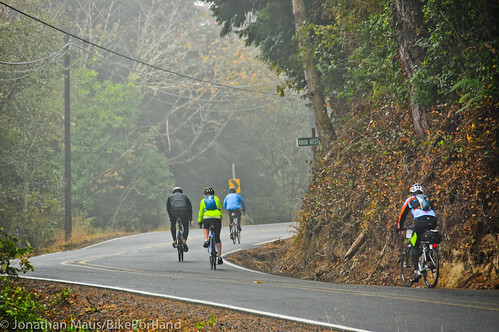 Last week I joined about 50 other folks for a ride down the Oregon Coast Bike Route. 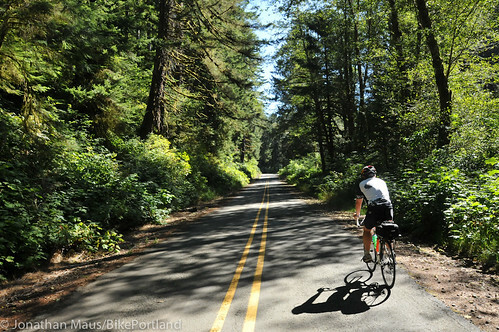 In six days of pedaling, we covered about 370 miles — most of it along the shoulder of Highway 101. 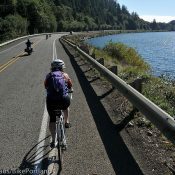 This route isn’t just one of the premier cycle touring routes in the world, it’s also an official Scenic Byway (as designated by the U.S. Department of Transportation), a key commercial corridor that fuels Oregon’s timber industry, and an artery for the many cities and towns it passes through. 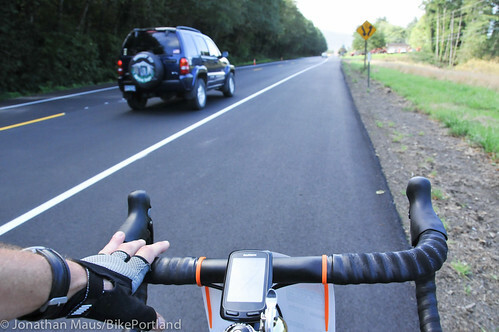 During my ride I tried to pay special attention to how these widely different uses of the road are balanced both by the users themselves and by the agency in charge of Highway 101, the Oregon Department of Transportation (ODOT). What I actually discovered out on the road, was that the route wasn’t as bad as I thought it would be. I found it to be a very mixed bag: Some sections were like Russian roulette, while others offered a glimpse of what a world-class coast route could look like. Even without much of a shoulder, the low traffic volumes off Highway 101 make this a wonderful place to ride. Otter Crest is fantastic. It’s one-way only with a general bike/walk lane that is signed and physically protected with plastic bollards in some sections. We saw only a few cars while climbing the ‘Seven Devils’. and Old Coast Road near Gold Beach. Those diversions from 101 and the few other detours and side trips I discovered thanks to my trusty GPS device (Cape Blanco State Park and Floras Lake), were the highlights of the trip. The other places where the Coast Route shines are locations where ODOT has paved wide and smooth shoulders. While far from the physically separated cycling path we dream about; having a wide, smooth and clean shoulder to ride on lowers a riders’ blood pressure considerably — even in the presence of large and fast-moving motor vehicles. 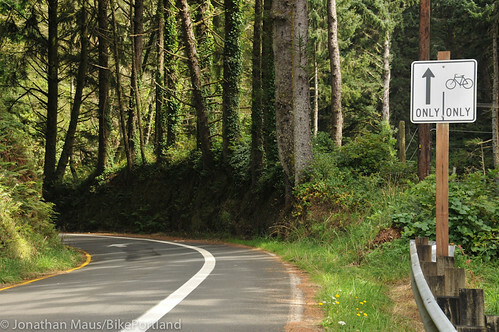 And finally, among the good things on the route are the relatively consistent presence of Oregon Coast Bike Route signs. While they often preside over inadequate conditions (more on that below), and many of them could use a refresh, at least they were there. When you’re riding just a few feet from fast-moving, large motor vehicles, it doesn’t take much to create a bad cycling environment. 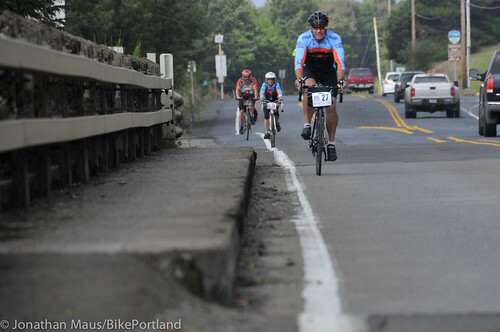 At too many locations along the Coast Route, ODOT has failed to maintain the shoulder and the resulting cycling conditions are unpleasant and dangerous. At a minimum there should be regularly scheduled maintenance in the peak cycling season that’s performed specifically with cycling in mind. I couldn’t change my camera settings in time for this shot, but you get the idea. I also noticed several locations where the soil adjacent to the highway is eroding and ODOT has simply moved the guardrail further into the shoulder. Unfortunately as they move the guardrail over, they don’t re-paint the stripe so the net result is a narrower space for cycling. This also happens when other things like vegetation (and in some cases sand) encroach onto the road. ODOT should consider re-painting the lane lines to maintain a minimum and consistent width for the shoulder. In general, I think ODOT should make a much greater effort to maintain a 4-6 wide shoulder whenever possible. Bridges, tunnels and cities are the places on the Oregon Coast Route where, in my opinion, ODOT completely fails to live up to their responsibilities. 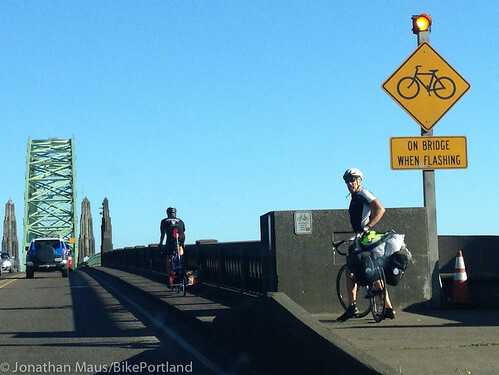 On Coast Route bridges, there’s usually very limited space for riding. However, instead of doing anything to impede or slow down people in cars, the onus for safety and life preservation is almost always put on bike riders. 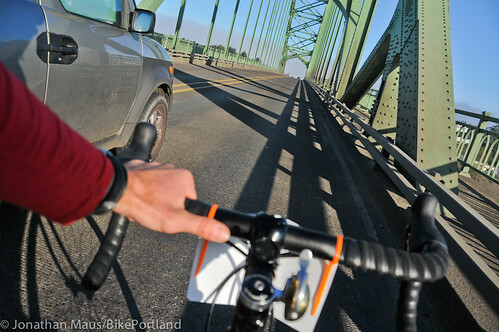 On larger bridges like the Yaquina Bay Bridge in Newport, ODOT gives people on bikes no good options. I followed these directions on the Yaquina Bay Bridge and got honked and yelled at repeatedly by people in cars wanting to speed past me. While the large bridges tend to get most of the attention, I found that the dozens of smaller bridges along the Coast Route are also more dangerous for cycling than they should be. Countless times I was biking along in the shoulder, only to look up and notice that the shoulder — and often the stripe that designates it — disappeared as it crosses the bridge. In its place was usually a large curb that jutted out into the shoulder and narrowed the roadway. This puts people on bicycles even closer to adjacent traffic and there was never any warning about “Bicycles on Bridge Roadway” or any pavement markings to facilitate the situation. 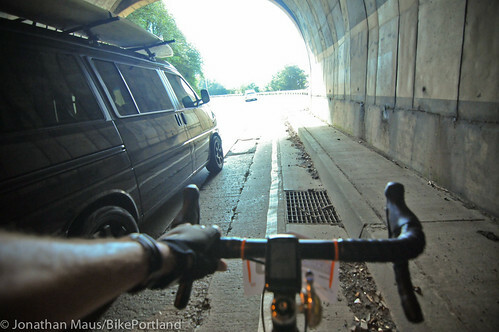 Tunnels along the Oregon Coast Bike Route are perhaps the scariest — and ugliest — parts of the route. 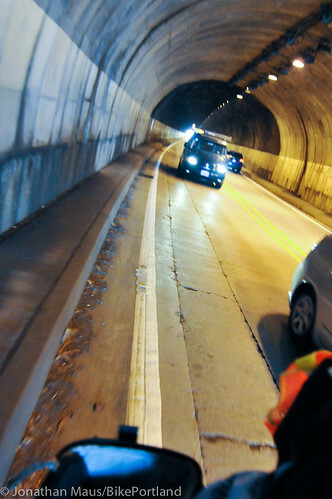 Similar to large bridges, ODOT’s bike safety practice for tunnels consists of button-pushing and flashing lights on yellow signs. The Arch Cape Tunnel is perhaps the weakest link on the entire route and many people have scary stories to share about it. Not only is the paltry flashing signal and sign ineffective at encouraging courteous driving, the extremely narrow shoulder inside the tunnel was full of debris. Add poor/non-existent lighting and a few recessed storm drain grates in the shoulder and you have a terrible cycling environment. My proposal for ODOT on tunnels and bridges is to scrap the silly flashing light and sign. Instead, create “No passing when bicycles are present” zones. These bridges and tunnels are all quite short in length. Isn’t the safety of other road users more important than a few seconds saved? Overall, the Coast Route wasn’t as bad as I expected. In fact, with a few tweaks here and there, and more TLC and attention to detail from ODOT, it could be vastly improved. Some day I would like to see a physically separated cycle path the entire length of the coast. 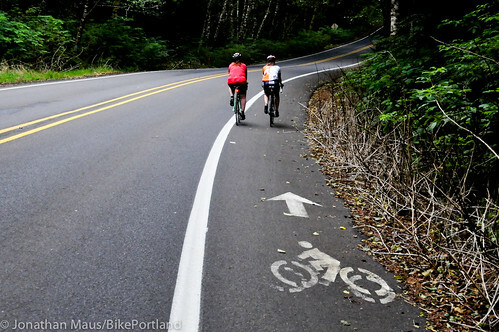 But until then, ODOT needs to understand that the quality of the Oregon Coast Bike Route — which is an international tourism draw that pumps thousands of dollars into the small towns along the route every year — is only as good as its weakest link. 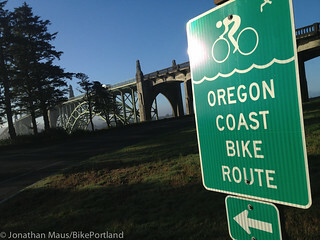 — Read more about my ride on the Oregon Coast Bike Route here and view more photos in the gallery. More important than a few seconds saved? My god, man, these people have antiquing to do! Someone could beat them to the last of the PB&J taffy! Maybe we need some kind of surprise reverse inspection system. Like, a couple times a year somebody from Cycle Oregon shows up at the regional ODOT office unannounced and everybody has to go for a ride. If they find themselves dreading that day rather than looking forward to it, then they need to ask themselves how they can do their jobs better. The problem with signs that is that they are universally ignored. If I had a nickel for every time I’ve seen drivers go past multiple “exit only” signs only to make fast and often dangerous lane changes only when they arrive at the exit itself, I could have retired long ago. A sign that says “no lane changes” at the bridges and tunnels won’t work any better on the coast than it does through the tunnel on 26 going into downtown Portland. On the other hand, it’s great to know that most of the coast route is much better to ride than expected. Even so, I’m not confident enough to ride it, and I suspect that I’m far from alone. Too bad, too, because I can’t think of a better way to see the coast than on a bike. It looks like those smaller bridges have very similar design characteristics to the Barbur Blvd. bridges. Excellent summary, Jonathan. Thanks for taking the time to give this overview. Your post doesn’t do anything to boost my confidence regrading riding the coast route. Sadly, it will continue to be a route I avoid seeing by bike. Also, the light traffic noted for some roads likely reflects the time of year. No, most of those roads are light traffic all year round. There just are not too many people along the coast. Holiday weekends in Summer (4th of July) might be slightly busier, but not much. While I agree that the infrastructure on the coast isn’t great, if you have some practice riding on country roads and highways, it isn’t too bad, and the scenery in many section is amazing. I recommend the southern section of coast, if you can only do part of it; there is less traffic, there’s great scenery in the very southern end, and there are no scary bridges or tunnels south of Coos Bay. Another day to go down to Crescent City and explore the Redwoods can be worthwhile. It would be sad if you let exaggerated fears (yours, Jonathan’s, or others) keep you from an awesome experience. 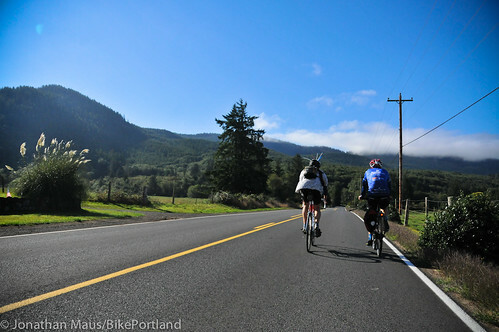 The absolute risk of riding the Oregon coast is miniscule, and the rewards are huge. Just remember that adventures, by definition, are going to stretch your comfort zone. The blurry photo of the RV is no exaggeration. I spent 4 days on this same route and had two different RV’s come within 6-12 inches of my thigh while going 40mph. Never again. Some people view these as valid fears and suggest many other safer routes. I’ve toured thousands of miles, and these are the worst 300 for safety. Dave. You sound judgmental when you call other people’s views “exaggerated”. I rode the coast with my dad & brothers in 2011. Happy to have done it, and I have great memories of the trip, but I’m also really thankful we all survived and I would never do that again. That’s a weird way to think of a road trip, isn’t it? Glad I SURVIVED?! TOM, the Coast Bike Route follows the 3 Capes road from Tillamook, and then avoids Cascade Head (a really harrowing shoulderless climb) by cutting inland on Slab Creek Rd. (really quiet) to Otis. So, it pretty much avoids 101 and it’s actually a really scenic and (relatively) low traffic portion of the coast ride, IMO. Not great on a summer weekend, though. I continue to think that a world class build out for cycling would more than pay for itself in 10-15 years’ time. Imagine an Otter Crest type experience all the way down the coast… or at least a separated bike lane that went off on it’s own wherever possible. A lot of otherwise non cycling people would come a long ways for that. Not everyone would do the whole thing in a week, but the draw of knowing you could go to the coast and have a safe, beautiful ride wherever you went would be an incredible tourist magnet. Here, here, Pat. I agree with Jonathan. 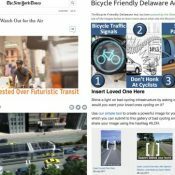 We should improve what we have (I love this “mostly” scenic bikeway!) but a physically separated path that is accessible to users of all ages and abilities is what we really need. We should take it on as one large project. It should not take 20-years to complete. This project would economic boon to coastal communities and the state not only in short term construction jobs but a long-term active tourism draw for cyclists, hikers, families, and locals. This would not be just for tourism, though. A coast pathway would be utilitarian by providing a safe non-motorized transportation option for commuters, students, shoppers, etc. It could provide an evacuation route and disaster relief as well. This is the kind of large and important project I can get behind (all boon no doggle). I think Oregonians of all walks of life could too. I propose we make a Tom McCall Coast Pathway in honor of the Governor who saw what a treasure our coast was and helped protect it for all of us to enjoy. To any doubters, don’t tell me why we can’t do this. Tell me why we shouldn’t. I love the idea. Having ridden the coast, I’d love to see where you think this new path will exist. Fantastic post. Although there are sections I have ridden and/or will ride (especially the Three Capes), it just reinforces my intention to NEVER attempt to ride the entire coast, except as part of a large group like you did. And even then, it’s not that high on my list. Just too dicey in too many places. Great writeup. One of the most disappointing things about the new state bicycle routes is the lack of money to improve them. Having been on several of them, I’d say many are the same mixture of the sublime and the awful as the Oregon coast. At some point you’ll have to do something stupid/dangerous because there wasn’t money to expand a shoulder or put in a traffic light to cross a street. 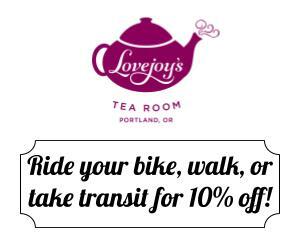 What about a very modest hotel tax to fund tourism infrastructure improvements for bike routes? It’d draw more people than the proposed convention center hotel, I’m sure. My dad and I rode from Blaine to Brookings a few years back and that tunnel is extremely scary. We didn’t know it at the time but it is possible to detour around it, although the detour is over 10 miles extra so we probably would have tried our luck anyway. Just like Tom, we drove up from Lincoln city to Cannon Beach (this past week) and there really isn’t any room for a cyclist on either side, though we saw more than a half dozen touring bikes at various points on Hwy 101. So even in the “off season,” there is enough bicycle traffic to warrant lanes. I also agree with another poster who posited that coastal towns’ revenue would benefit from having accessible, safe MUPs along the coast for tourism dollars. 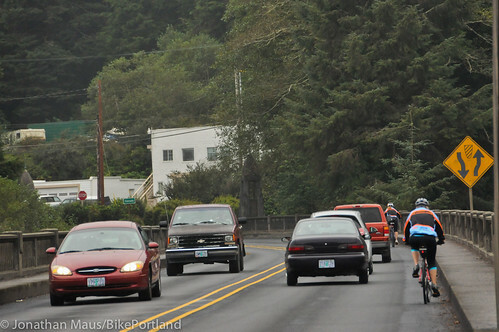 So, from an advocacy standpoint, how can we effect change and at least try to get some SAFE bicycle lanes on Hwy 101? The “No Passing While Bicycles On Roadway” sign could save lives. I love it! So, just wondering out loud but many of those bridges and tunnels look like they have 12-ft or wider lanes and 2-ft “sidewalks” (not even worthy of the name). What if the m.v. lanes were narrowed to 10 feet and the sidewalks were widened to 4 feet, and wide painted lines were added to route the shoulder onto the sidewalk via ramps? Add signage and beacons to slow m.v. traffic to appropriate speed for the narrowed lanes and congested infrastructure. I’m more on the fearless end of the biking spectrum, but the tunnels scared the crap out of me. I did a roundtrip from Seaside to Manzanita this summer and I agree. A logging truck approached behind me in the tunnel and I really thought I had made a bad mistake by not taking the lane and going as fast I could. When he passed me I thought I might die. I think your out of focus shot with the RV is perfect the way it is, like the old This is your brain on drugs commercial. This is you on a bicycle on 101. I’d say the vision portrayed is accurate for someone getting passed by those kinds of vehicles in that kind of space. 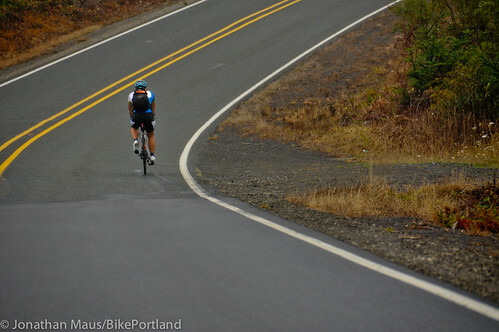 Nice write up on the joys and dangers of pedaling the coast. 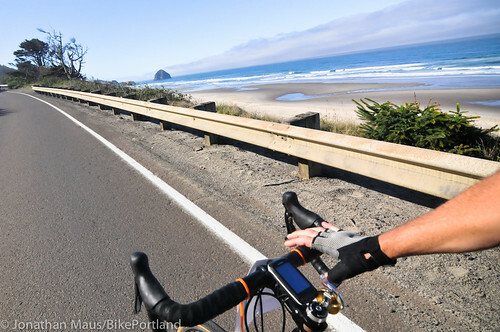 Each one of the problems you bring up about the Oregon Coast is present on the next section of the Pacific Coast Bicycle Route to the south in California. I am really looking forward to seeing if there are innovative solutions you can come up with. Here are a couple of observations from being professionally involved in some of these discussions in CA. 1. Bridges- each bridge has a finite lifespan. When they are replaced or repaired it is often a requirement to make them bike & ped friendly. (takes lots of time & money but does work). 2. Widening/Shared Use Paths. If the right of way exists this is pretty easy to implement, depending on what ODOT requirements there are for break down lanes and safe zones. If the right of way isn’t wide enough it gets expensive quickly as you have to acquire property. 3. The coastline has a lot of sensitive environmental resources (wetlands!). Make sure to set aside a good amount of money for mitigation. 4. Shared use paths cost about 1 million a mile just for construction. These are all things that can be overcome with enough persistence and funding. Sections of SUPs are being constructed through more urban areas in California but it isn’t easy and will likely never happen for large stretches of the coast (environmental, topographic, and regulatory constraints). If Oregon can lead the way perhaps California can see the light as well! 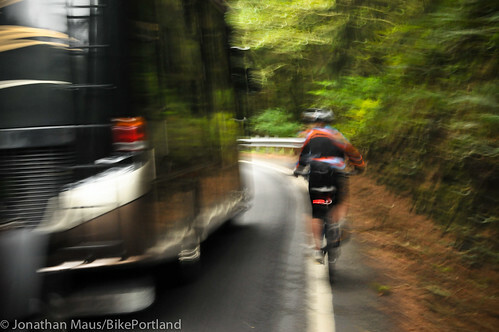 The blurry picture of the bicyclist being past by a RV is exactly how it feels–a blur of frenzied fear and hope. I would have taken the lane in the tunnel and where passed by that RV. I will not ride the white line when there is no shoulder. I’ve ridden the coast twice and never really felt threatened or scared and I’m fairly timid. Several times on bridges and in tunnels cars followed me in a way that made me realize they “had my back” and were protecting me. Both times I rode the coast it was in the depths of the recession and I do think the RV traffic was greatly reduced. At present there is a big boom in RV and travel trailer sales. I’m sure the impact is not good on a coast bike ride. I would be interested in finding out where that $1 Million/mile bike path cost comes from. Most estimates I have seen place the cost about the same as sidewalks or roughly $50K/mile. Nice article and pics. Unfortunately they reveal a lax attitude toward safety. In the photos there was very little high visiblity clothing being worn. That is your first and best defense against being hit by a motor vehicle. If a drive can see you they will try to avoid hitting you most of the time AND the earlier they see you the better their odds of being successful in not hitting you. When you get serious about taking responsibility for your own safety then, and only then, can you complain about drivers running down cyclists. All on the ride should have been wearing fluorescent orange or yellow clothing. I’m trying to understand why you keep saying this. If the drivers you imagine can’t see Jonathan & Co. in broad daylight in the clothes they were wearing they shouldn’t be behind the wheel. Are you symmetrically prepared to demand that all cars be painted only in fluorescent orange as well? Have you heard of distracted driving? When it comes to running into people on Hwy 101, a distracted, or impatient, or poorly trained driver is the problem. I’ll spare you the list of people run into on Hwy 101 who *were* wearing the garb you specify, in broad daylight. Yes! Just the other day I was talking to a friend about gun control measures, and he pointed out that I hadn’t bought a bulletproof vest yet. Boy did I feel silly. I mean, I didn’t even have my blaze orange cap on, and I was right there, out in public! He really should have shot me then and there to teach me a lesson. Nice write up. I ride the Coast roads all the time, plus HWY26 from Portland and share the same thoughts, bridges are dangerous and the tunnels are just downright scary. Shoulders are a joke in most places, I’ve found ODOT sometimes paints the shoulder stripes over sand and gravel, riding over that when you think it’s stable is life threatening. After 20 plus years of doing this I think my last trip a month or so ago will be my last until I see some drastic improvements. The scenic bikeways inland and MUCH nicer, I’ll stick to those. IF I wanted to do 101 , it would be an “unsupported ride” ie: no chase van to carry supplies, SO … an small trailer (Burly ?) to lug gear seems doable to me. Is there room on the shoulder ? Do other riders do it that way ? A “Bob Trailer” would be a better choice. It only has 1 wheel, and the trailer wheel tracks your bike wheel. A Burley, or other 2-wheeled trailer, limits how far close to the edge of the road you can move in the shoulderless sections. With just a bike, or a bike and a bob trailer, you can put your wheels pretty close to the right hand edge of the pavement, and have 1/2 of your body off of the road. With a Burley trailer, your bike needs to be about 15″ further to the left, so that the outside trailer wheel stays on the pavement. If you are a touring cyclist (and I am) 101 is super fine! I rode Vancouver to LA a few years back and have to say that I loved every mile, (PCH had some moments) but if you want danger do the Trans Canada Highway in Northern Ontario! I was living in Colorado the first time I rode the O coast from Astoria to Brookings in 1986. I remember riding both the Newport and Coos Bay bridges, both with no problems and seemingly courteous car and truck drivers. I guess that I focused my attention on the beauty and lovely climate on the coast that year, I have nothing but good memories. 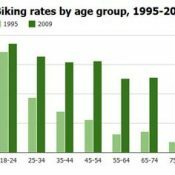 Why have cyclist and bike riders turned to such a negative attitude over the years? It seems like bickering and complaining is the norm, especially on this blog. Thanks for pointing out the “good” first, I agree with all of that, it’s a wonderful ride! You might have dealt with courteous drivers. It was a different time then. When we tried taking the lane on the bridges, we had large trucks swerving around us and honking. JerryW, I think people have turned negative because they don’t feel safe. It’s hard to enjoy the scenery when you’re anxious about the monster RV coming up your tail, not giving you any space. Also, RVs and SUVs have gotten a LOT bigger in the last 30 years. They take up more space, and the people driving them don’t seem to realize just how wide their vehicle is and how close they are to the person bicycling or walking right there. Also also, the people driving seem to have a lot less patience than you experience in the 80s. Everyone seems to be all, “GO GO GO AS FAST AS YOU CAN” all the time, and get angry when something causes them to slow up for a second. Or 5-8 seconds, as the case may be (carry a stop watch next time you drive around, it’s amazing). I want to agree a little with JerryW. I keep coming back to what Pete said here in the comments recently about the Barbur flap. Unnerving and unsafe are two different beasts. When I’m biking on 82nd or Foster or Sandy I just tune out the cars, like I tune out the yellow jackets buzzing around my sandwich at a summer picnic. Statistically speaking, they are not going to do any damage to me or my bicycle. If I worry about the one-in-a-million chance that they will, then I probably should just stay home. 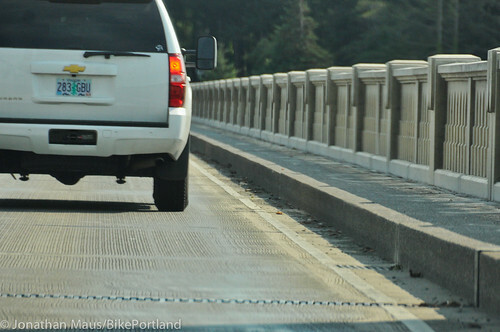 I also rode Yaquina bridge three times this year, and at least once each of the last 10 years, no problems, ever. I rode down the OR coast solo in Spring 2002 when I was pretty new to long-distance cycling & not as “strong/fearless” as I am today. I never felt myself to be in any danger. It was one of the best weeks of my life at that point. http://axoplasm.com/blog/distance . Agree with 9 watts that the problem is distracted drivers. A fluorescent orange or yellow top is akin to hitting that distracted driver between the eyes with a 2×4. WHACK! It wakes them right up! Other colors are just background noise as they travel along at 70 mph texting away. Do highway construction workers who work all day next to speeding cars wear blue vests? red vests? gray vests? black vests? HELL no! They wear high viz orange or yellow with lots of reflective stuff. Why is that? It’s about safety. It’s boring, it’s ugly, and if you do it every time you are more likely to not spend the rest of your life in a wheel chair or in the ground. That’s why. THINK PEOPLE!!!!! Car drivers have protection – air bags, lights, seat belts, crumple zones, etc – a cycist is the same as a dog running across the road. My thought on florescent clothing is that you are visible so far ahead that you are giving drivers a much wider window to be aware of your presence and the fact that they need to be paying attention to a cyclist on the shoulder. If the driver sees that there is a cyclist up ahead he might actually make an effort to stay in his lane etc rather that swerve all over the road to open his box of crackers, read his text message or whatever. Its no guarantee of course, but it can’t hurt. I share a similar sentiment, having ridden the areas between Astoria and Coos Bay on multiple occasions. I don’t. They fell over themselves to champion the CRC, which we can’t afford, and would have cost us more in interest than anything we could ever dream of doing for bicycle infrastructure might cost. I’ll second that! 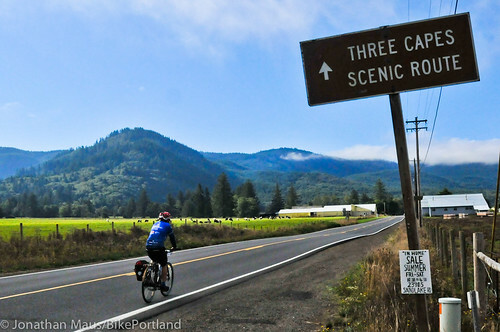 I rode into North Bend on a solo trip from Tillamook to SF in 2007. That bridge was terrifying. I’ll never ride it again. Also, the drivers along that stretch were much more aggressive – it is the only time I’ve ever had anything thrown at me. Also, I just rode Lincoln City to Waldport (with my Mom!). The traffic is much heavier than back in 2007, but south of Newport was much better than north. In the spirit of what ODOT could do… I’d like to see traffic volumes for each of the bike tour routes they list on their website – that info is way to hard to find. 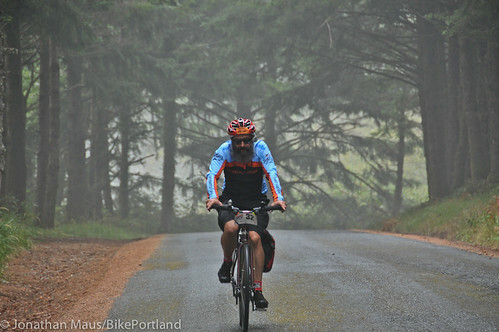 Thanks so much for the excellent write-up on cycling the OR coast. My husband and I just drove the southern coast with bikes on the van which came off for day cycles where there were alternative side roads. As you noted, riding on highway is ok in areas, ie. good wide shoulders. However, lots of places are very dicey. I hope your report becomes a working document for ODOT. We could have a world class route here. Hope it’s in my lifetime. 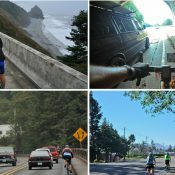 It’s interesting reading all of the comments about not wanting to ride the Oregon Coast Bike Route because people feel that it’s an unsafe place to ride. You have no idea how nice it really is until you’ve done a cross country ride and experienced some truly bad cycling situations. The key to safely negotiating almost any situation is proper bike riding techniques and being extremely aware of your surroundings at all times. I did the Amgen Coast ride with Jonathan and everyone else, it was great fun and something I’ve always wanted to do. I would give the road conditions a B- overall, with some sections of the shoulders so bumpy that I aggravated my already bad back (Newport to Yachats was especially awful). Near Florence I biked on the road when the shoulder was too rough, and I guess I did not notice a few cars backed up behind me. I pulled over into the shoulder and what followed was the lone confrontation with a driver I had that week. A white-haired man pulled his truck over ahead of us and got out. He angrily pointed his finger at me and said ‘Get off the road!’ When I calmly replied to “Share the road,’ he threatened to kill me with his truck. Along with some choice expletives that made me wonder if he was serious. The three of us bikers kept pedaling, nervously looking for the truck to pass us again, and I was prepared for evasive maneuvers. Luckily, his rage must have subsided because he drove past us without any incident, but those were some tense moments. All because the shoulder was so unridable. It occurs to me that taking the lane is perhaps the most commonly, most easily misunderstood practice we (some of us) engage in. I have friends who I can’t disabuse of the notion that bikers who do that are selfish, flouting the law, trying to pick a fight, and so on. While there are a hundred historical, cultural, habitual reasons why taking the lane is misunderstood, I wonder how we could approach this in the spirit of a public service announcement? Some clever way to communicate the situationally specific necessity of taking the lane; some of the chief reasons why we might do this, and a few suggestions for how those who are driving behind us should conduct themselves. Thoughts? That is a crime called “menacing”. I’ll weigh in one more time to comment on the motorist that threatened Willard C.: The motorist broke the law by threatening you. If something like that ever happens again, get his license number, description of him and his vehicle and file a police report. Check with Ray Thomas for clarification on this. 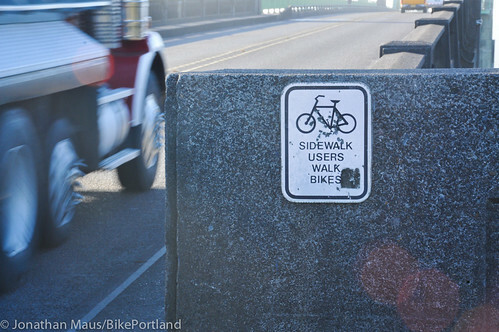 Second The signs on the Yaquina Bay Bridge that say “Bicyclists walk bike on sidewalk” is not a regulatory sign (I’ve looked it up). Bicyclists are not required to get off their bikes and walk. That being said, because the sidewalk is very narrow you really have to decide how safe it might be to ride on the sidewalk. I commuted back and forth on that bridge for almost 30 years and I’ve calculated that that’s enough miles to cross the U.S. I was the one that was instrumental in getting the flashing lights and speed reduced to 35 mph from 45. 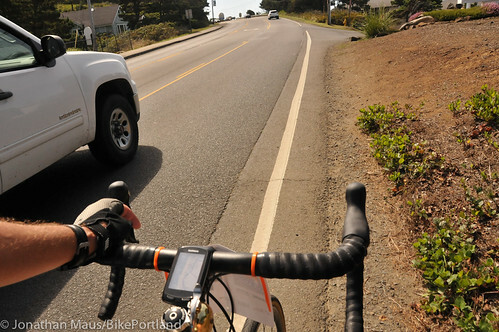 I continue looking for ways for bicyclists to safely cross the Yaquina Bay. I’m currently working on getting sharrows on the roadway to give motorists another chance to realize that this is a shared public facility. I continue advising cyclists to take the lane and not ride so far to the right that motorists will try and “squeeze by”. How long did it take you? How many times did they deny your request before finally changing the sign? Just a reminder, folks, feel free to contact ODOT with any and all complaints and requests. Best to make multiple, single-issue, single-location requests. You don’t need to be biking the coast to do this. If you’re driving, have the passenger snap photos, and send them in next time you’re stopped, while they’re fresh on your mind. Then half of them will be fixed *before* you embark on your coast ride. About half of the problems Jonathan encountered are just poor maintenance and a lack of updating signage to modern standards. They’re easy problems to fix, most can be solved with a single email request. Also, sharrows on bridges is an easy one. Especially since ODOT is a trendsetter rather than a footdragger on this application. They did St. Johns, then Oregon City. Next, Yaquina Bay? I bet it would dramatically cut down on honking and close passing. Make each request as specific as possible. Avoid broad descriptions like “There’s crap on the shoulder all the way from Coos Bay to Bandon.” Instead be as precise as you can, with reports like: “There’s woodchip debris in the southbound shoulder of Highway 101 from milepost 121.6 to 120.3, and again from 119.8 to 117.2” Break it down into manageable work orders for ODOT staff. … To make riding safer for you and other bicyclists, report unsafe road conditions to local authorities as soon as possible. Second — To report unsafe conditions, go to the “just ask ODOT” page and give them as much information as possible. Type of defect, mileposts, etc. Solution — send in a maintenance request. Give them the mileposts affected, in as accurate of detail as possible. (southbound shoulder, mp 40.5 – mp 38.9). If you break it into chunks of 5 miles or less they’ll probably find it more palatable. Send photos of the worst spots. Photos will help the dispatcher decide whether to send out the sweeper, the grader, or the shovel team. Refer to the Oregon Bicycle and Pedestrian Plan, p. 173. Section B.1. Sweeping. Solution — send in a maintenance request. Again, give them the mileposts with as much accuracy as possible. Take photos of the worst sections. Use a Contour Gauge if you have one ($20 at Woodcrafters) Trace the gauge shape on 1/4″ graph paper for best presentation. If you don’t want to bring one, bring a lightweight ruler you can use with any straightedge to report the height of the “step” between the shoulder and the travel lanes. Take photos of the ruler, straightedge, and a recognizable roadside feature in the background. Refer to the Oregon Pavement Design Guide (2007), p. 22. Section 6.1.2.2 Shoulders. Solution — bring a measuring tape or measuring wheel. In these “zero shoulder” spots, measure the width of the driving lanes. If they are more than 12′ wide, they are out of compliance and should be narrowed by moving the white stripe towards the center lines until they’re only 12′ wide. Send in your maintenance requests. Anywhere where the bike lane/shoulder is less than 5′ wide and the car lane is more than 12′ wide is a candidate for stripe-moving. Take photos of your tape measure or measuring wheel, ideally with a recognizable roadside feature in the photo. (This one will take them about a year to complete, but it certainly isn’t going to happen unless you send it in. I sent in a request for this on NE MLK (Schmeer – Marine) and N Denver (Argyle – Schmeer) in 2008. It took 2 years, but it’s a big improvement now that it’s done). Refer to the Oregon Highway Design Manual (2003), p. 7-10, Rural Highway Travel Lane Widths. Buy a measuring wheel at Harbor Freight for $10 — you can use it as fast as you can walk across the street. http://www.harborfreight.com/1000-ft-measuring-wheel-95701.html Alternatively, you can use a measuring tape — wait for a gap, and be careful not to get run over. Have a friend hold one end for you. Solution — each of these bridges should have a “[Bicycles] ON BRIDGE ROADWAY” sign at the entrance to the bridge. This is a diamond yellow “bicycle symbol” sign (W11-1) and a rectangular yellow “ON BRIDGE ROADWAY” sign (OBW1-7) below it. Send in your maintenance request for each of these. Look at both ends of the bridge to see if a sign is necessary for both directions. Go out and ride, shoot pics with your cell phone, make notes at stops, and send in those maintenance requests. Thinking about it, you can skip the decimals in the mileposts, probably more trouble than its worth to try to estimate exactly where the problem starts and stops, just say 112 – 117. 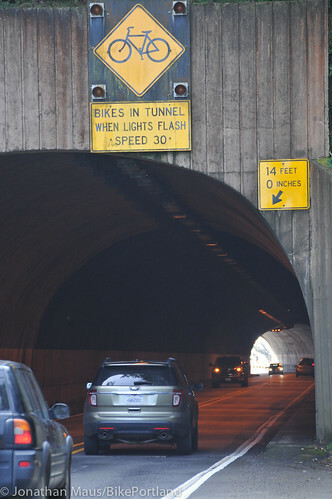 Another easy request is to ask the Oregon State Police to remind drivers that the advisory speed in the Cape Arch Tunnel is 30 mph when a bicycle is present. Its an easy one for them to stake out, have a motorcycle parked at the far end of the tunnel, run a bicycle decoy officer through the tunnel, & when RVs bust out of the south end of the tunnel at 50, pull them over and have a little chitchat. If any of ya’all ever felt at risk in that tunnel, send a request to the OSP. I have ridden from Oceanside to San Luis Obispo. While there are some sketchy areas of the Oregon route, it is a (insert expletive here) cakewalk compared to California. 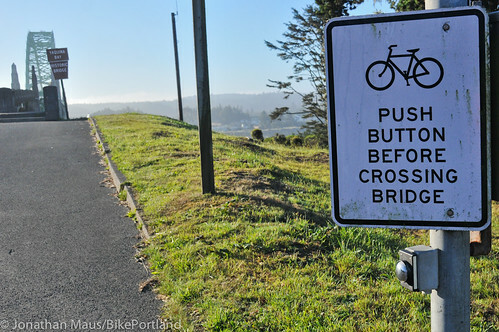 The Oregon Coast Bike Route could definitely use some improvements, but I would not want anyone to feel discouraged from riding it. 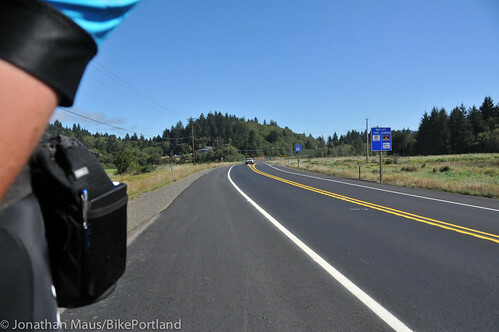 I am not a fearless rider and keep almost entirely to routes with dedicated bike lanes or marked shared routes, and still managed to have a very positive experience – on the Oregon portion, at least. 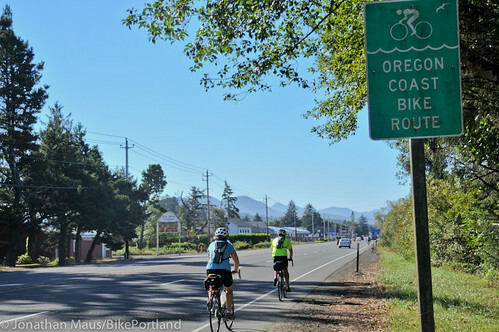 I rode the Oregon Coast route and CA 1 to SF from Astoria in June. Oregon was, by far, the most pleasureable, cleanest, and safest riding environment of my 880 miles. Heck, I had a logging truck stop and block traffic for me going over the Newport bridge. Anything can be improved, of course, but try riding from Ft. Bragg to SF before you get too hard on yourselves. IMHO, Oregon is a pretty damn nice place to ride. Oh, you could turn off the rain. The two long bridges on OCH 101 (at Newport and North Bend) are 41 inches wide on the sidewalk, which is my recommendation to avoid the hassles of selfish car drivers. I have pedaled over both on the walkway with no issues, which is indeed faster than walking. I’m a pretty confident rider, but one’s riding ability does little if anything to mitigate some of the hazards you describe on this route. I’m not sure if I would ride it. When you cross a bridge or ride on a curve with virtually no shoulder, like the ones pictured above, you are literally leaving your life in the hands of car drivers. I’ve biked on stretches of road like this before, and I kind of feel stupid for having taken the risk. You’re just kind of crossing your fingers. Take risks like that enough times and you’ll get hit eventually. I won’t do it anymore. off the bike to land on my back across the middle line in the highway. I figured I was gonna die. The road was quiet, with no traffic in either direction for five minutes. The tunnels continued to scare me, as did the L. O. N. G. walk across the Coos Bay Bridge. This trip was hard and fun by myself. Been busy for the last few years. Ready to go again. I just got back from Europe and was blessed to ride on many bicycle only roads and lanes. I found your wonderful article while researching an Oregon coast run for the later part of this summer. If there was a dedicated track along the entire coast thousands more cyclists a year would come to ride it–or so I’d wager. Thanks for sharing! I loved cycling through Oregon, and felt perfectly safe 99% of the time. There were people from all over the world who had come for the ride up the coast and I don’t recall a general attitude of complaint about the safety. Most people were frankly enthralled with the scenery and great campgrounds. I recommend the trip to anyone who will listen. On the other hand while I was descending at 50km/h a house size RV absolutely BLEW past me, creating a speed wobble that nearly sent me to the hospital or worse. Thankfully I pulled out of it but needless to say I the fun part of the hills was ruined for me the rest of the trip. I’m sure whoever was driving that RV had no idea that anything out of the ordinary had occurred. I should probably be posting this in an RV forum. Just did the ride from Astoria to Brookings with my sister ( wife drove a U haul van ), couldn’t have been more pleased. The weather was perfect. I know luck played a factor, but the ride itself didn’t seem that bad to me. And the bridges didn’t seem DEADLY. Your riding a bicycle down the highway! Your going to have a risk worth reward scenario. Probably should add the U haul took us through the tunnels. Pretty ugly, but I see no way they can be avoided. ( other then cheating a little ☺️ ). PS everyone complains about the logging trucks, they are the least offensive of all vehicles. The drivers are very used to cyclists and for the most part very respectful of your fragile spac. Bandon, Oregon had a meeting in August 2017 to consider a road diet for ODOT’s highway 101 through the central city. Port Orford, Oregon and ODOT gave highway 101 a road diet through most of the city sometime between 2009 and 2017 so it now has a median and bike lanes. Some coastal cities and valley towns (highway 38) now have live safety ready speeder digital signs at the edges of towns. I haven’t been on the coast for very long yet but I know Lincoln county pretty well, and at some of the sketchy no shoulder curves if you’re someone who uses wider tires, you can use the Oregon Coast Trail as a less stressful alternative. Some spots of the Trail are literally just on the other side of the guard rail. It is always a slower option and it’s not a good idea on a wet day but it’s safer and even more scenic, I’m the type that rides the way I did when I was a kid. Whatever way keeps me out from under a truck tire. On the sidewalk or trail respectfully, on the street or the shoulder cautiously. Or whatever is safe and efficient. Just be aware of your surroundings and be careful. My advice, Take the lane if there’s no shoulder and get out of the way when you can. Don’t ride in fear but remember that that is at least 5000 pounds coming up behind you. But when it gets tight, just be happy that riding an eight inch shoulder and bunny hopping hub caps hones your handling skills. I notice much of this was written in 2013. Has much changed since? I took my family on vacation on the coast in 2016 (I’m in Utah) and don’t remember seeing a lot of bike paths or lanes. We drove from Brookings to Coos Bay. Loved it! This summer me and a group of friends are planning to do this ride. Some of our wives will be driving the route. Sounds like it might be a good idea for them to drive ahead and scout the route, then wait for us to catch up and drive in the right lane behind us with emergency flashers turned on through the most dangerous sections in order to prevent some of the situations described. @Alan, I live just a couple miles inland from 101 and I can only speak from my recent travels in the local area ( Coos Bay/North Bend ) but there are small areas that are somewhat dangerous that have been improved the Coquille river bridge North of Bandon now has warning lights and a button since 2016 and the Wild Rivers Council has put in an MTB trail near Whisky Run beach. If you take 101 North, you will find some interesting side roads that can be explored. The Old Seven Devils road out of Whiskey Run is largely gravel and narrow/steep but very little travelled. It might be fun on a touring MTB, and it connects to the main 7 Devils road coming into Charleston. Cape Arago highway isn’t exactly as safe as it could be, it has moderate traffic at times depending on the shifts of Superior Seafood. When you do get over the McCollough Bridge try taking North Bay Drive, it’s hillier but avoids the wind tunnel of the causeway and 101 through to Hauser. Also just past the yellow light at the end of North Bay there starts Wildwood drive which is part of the old 1920’s Old Coast Route. It’s broken up into sections but taking it to the crest at Clearlake, south of Winchester Bay avoids the speeders and exhaust of the traffic climbing out of Tugman park. Also Wildwood Drive takes you through Lakeside, it’s pretty and bucolic. Unfortunately Wildwood is not well maintained, it’s a bit lumpy and potholed in spots, but the traffic on it can be almost zilch most days, and it winds it’s way through a few of the ponds and lakes east of the Oregon Coast Dunes. I hope you enjoy your trip, it’s a marvelous area.